The University of Houston is a leading institution in engaging with their students on social media. The following text and images come directly from the page they label “Why Follow UH?” which gives a number of great examples of how they’re engaging their students. Check out their social media pages to learn more about what they’re doing. The University of Houston utilizes social media for many different kinds of messages, including emergency communication, news, events, community spotlights, community feedback, and much more. National Wear Red Day (2/7/2014) [Instagram Contest]National Wear Red Day Instagram ContestSnapChatUH’s Snapchat followers were sent hints regarding the locations of five Valentine’s Day cards hidden around campus. The 5 people who found the cards were rewarded with boxes of UH chocolates. National Wear Red Day is all about heart disease awareness. Since UH is such a major player in health research, this issue was important for us to promote. 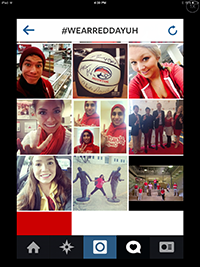 This year National Wear Red Day also happened to fall on a Cougar Red Friday, so we offered special prizes to our Instagram winners who wore RED and best embodied the spirit of this day. Prizes included two basketballs (signed by legends like Hakeem Olajuwon and Clyde Drexler), a mini-football (signed by the whole UH Football team), and an opportunity to throw out the first pitch at a UH Baseball game. 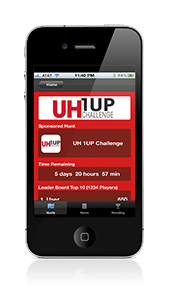 UH created a scavenger hunt in which students were asked to complete a set of tasks. Tasks included doing community service, meeting with subject librarians, getting involved in student philanthropy awareness events, finding the UH DPS office, following UH on Facebook and Twitter, and more. All participants who finished all tasks received a special UH bag. Each person who finished was also entered into a raffle for great prizes, including a MacBook Air, and 5 iPad Minis. UH’s social media team roams campus on select Fridays, giving away T-shirts to people who wear red. We usually announce our giveaway location the morning of the event from at least one of our social media platforms, and we share the photos via Facebook albums. Occasionally throughout the years, UH has engaged our Twitter audience in trivia contests, with prizes ranging from UH basketball tickets to UH alumni folding chairs. At the end of each semester there is an event in the library called Finals Mania. At this event, students enjoy pancakes and other goodies, and take a break from studying for finals. At this event, the UH Social Media Team usually hands out goodies like lapel pins and T-shirts. Photos from the event are shared via the UH social media channels, and tweets and Instagram images using the hashtag #FinalsMania are aggregated on a UH.EDU webpage, which is promoted via UH social media. At the end of each semester students, parents, and friends can share thoughts on Twitter and Instagram about Commencement, using the tag #UHgrad. These thoughts and images are aggregated on a UH.EDU webpage, which is promoted via UH social media. This is a post from my ongoing effort to highlight interesting examples of social media efforts by colleges and universities every Monday. Have an example to share? Tweet me.